— What is a synthetic lawn? A synthetic lawn is an outdoor landscaping option that allows you to have a beautiful, natural looking, perfect green lawn all year- without the hassle! 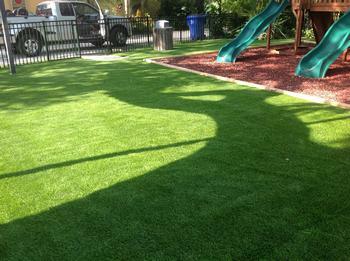 No worries about mowing, fertilizing, watering, pesticides or any other growth & health lawn maintenance. It's amazing how realistic our artificial lawn products look – give us a call and we'll show you our broad variety of turf options. — How is a synthetic lawn installed? There are four basic steps: First, we provide the design and site preparation which may consist of removing existing landscaping. Second, we prepare the sub-base which may include an aggregate base for drainage and a finer base for shaping and achieving a smooth service. 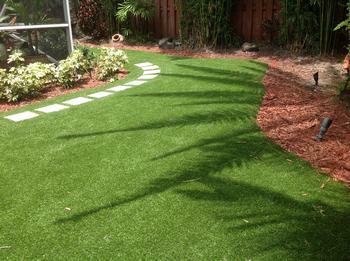 The third step involves the actual lawn turf installation. Lawn turf comes on 15 ft rolls. 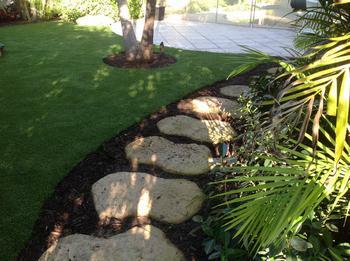 The turf is seamed as needed, shaped & pinned using various landscaping pins and stakes. Click here to see more lawns! The unique installation methods used for our proprietary EdgeLawn® Synthetic Lawn System™ will keep the surface temperature more comfortable during hot weather. EdgeLawn stays cooler in the South Florida summer heat. That's because we have a specialized process shown to keep surface temperatures up to 20-50% cooler than typical installations, which makes a huge difference to your tender feet! No Watering. No Mower. No Fertilizer. No Pesticides. Fresh, clean, renewable water resources are becoming more scarce, yet everyone wants the comfort and beauty of a thick, green lawn. How about a beautiful, perfectly manicured year-round lawn without the hassle, cost and recurring expenses of constant mowing & maintenance? 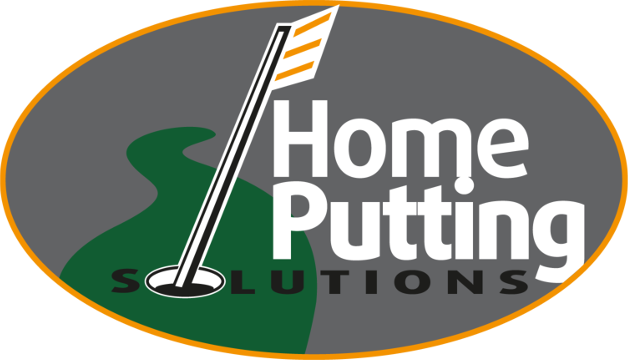 Home Putting Solutions offers one of the widest selections of premium artificial lawn turfs. 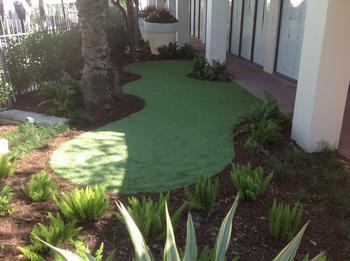 Many commercial entities have found that adding synthetic turf to their grounds - hotel, daycare, church, dog kennels, schools, etc - provides a functional and cost-effective landscaping solution. Wide variety of turf styles available from two of the most respected and experienced (over 50 years combined) artificial turf mills. Always looks and feels like a perfectly healthy natural grass lawn, without any of the maintenance. Multiple"grasses" to meet your specific landscaping need: Centipede, Rye, Zoysia, Bermuda, and more. Eliminate annual maintenance costs and effort required to water, mow, overseed, fertilize, apply insecticide, etc. Attractive, durable and safe for years of enjoyment - great for families with kids and pets. Won't attract insects, accidents wash right through, and allergen-free. 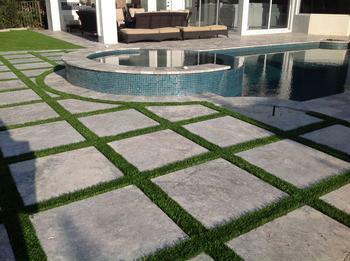 Effective water conservation while providing warmth, beauty & functionality of natural grass. We love transforming yards, and we treat every project as if it were being built in our own home or business.